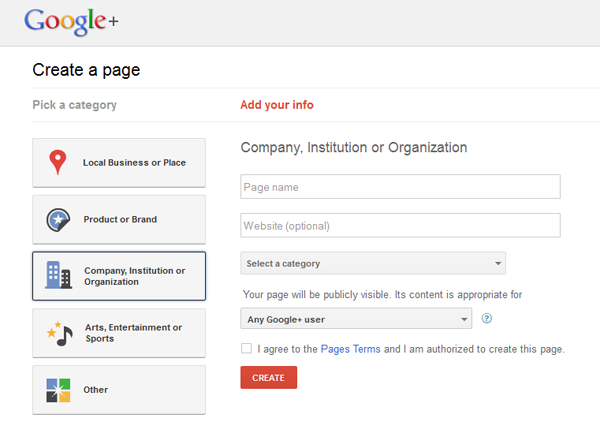 As promised, Google has finally made an official way for businesses and organizations to sign up for their own Google+ page. If I’m to be completely honest, I’m still not the biggest fan of G+. My experience, based on my personal account, is that a lot of people signed up, realized it (generally) wasn’t much different than Facebook and have been inactive ever since. Right now, Facebook is still king. That said, it may be something you’re interested in using for your church. Like any new communications tool, it’s always good to evaluate if it’s the right thing to use to reach a specific goal. Since Google+ may be right for you, I wanted to share some basics of getting started and a few things to think about when diving into the G+ circles. Next, select the “Business, Institution or Organization” tab and fill in the basic information Google asks for. That’s it. Easy enough. Once you create the page, then you can fill in some of the basic information about your church, promote it to your friends and start sharing. One of the nicer Facebook features for organizational pages is letting multiple people have administrative access to the page. It’s good because it lets multiple people handle updating. It also gives you some security of not being locked out of your account if there’s just one admin who decides to leave the church or not update the page any longer. I’m guessing this is a feature that will eventually come to Google+. There’s even some language Google uses that implies it will happen. But right now, it doesn’t exist. After 25 people like your Facebook page, you can get a custom URL like, shameless plug number one, facebook.com/churchjuice. That makes it easier to promote. For Google+, your web address includes a long number that identifies you. There is no short, catchy custom URL. One way to get around that is to use an independent URL shortener like gplus.to. While it’s not officially affiliated with Google, you can put in that identification number Google gives you and it will create a custom URL like, shameless plug number two, gplus.to/churchjuice. It’s always a challenge to get your organization to show up higher in Google searches. It’s assumed Google has made G+ pages search friendly and will show up higher than Facebook pages. Showing how important G+ is to Google, they’ve already changed what “+” means in searching. It used to be a modifier (as in “church” + “communications”). Now, it’s tied more directly to Google+. If anyone searches an organization and puts a “+” before it, the organization’s Google+ page—and its tagline—will be the first result. So there are some initial thoughts on the new business pages for Google+. Anything you’ve experienced so far? I completely agree, you must evaluate if it is worth putting in time and effort for your church. One feature that I think could be killer for churches is the “Hangout” feature. Just think about starting impromptu video hangouts for your community. I went to Harvest Bible Chapels 10 am service on December 25, 2011. They started off with some beautiful songs by a woman who had a great opera voice. The next thing disturbed me. They showed a video of Christ birth with small children playing the parts. It appeared that the video was pulled off of you.tube? The video described the events leading to Christ birth and the account of His birth. Everything shown was from the scriptures, what did not sit right with me was what the video created in the audience. It turned the most sacred event of the scriptures into a humorous, to almost non-reverent event. I was appalled by the video. This event should not have even been shown to be comical.